I'll let you figure out how to read the title (you may want to cover your children's ears for one of them), but the following post will cover some helpful practical info I've recently learned the hard way. Basically, there are a set of figures and data that must be consistent across various LEED credits. This isn't a big problem, but it's very easy for separate trades (civil, landscaping, architect, electrical) to be working from different sets of drawings with slightly different figures. If everyone finishes their documentation with different numbers, someone is going to end up doing their work over, which is a huge annoyance and waste of every one's time. Though the following may seem obvious for those working on simple projects, determining a site boundary gets much more complex once you add multiple buildings or on a nebulous site, i.e. a campus or master-planned development. Your boundary may end up changing over time, and it's really only important that these numbers are nailed down before everyone starts their final documentation, but at the same time I like to keep them updated so I can do back of napkin calculations over the course of the project to make sure we're on the right track and no nasty surprises emerge (e.g. "Oh yeah... we're going to need another 2 acres of open space"). Please note the proper use of both i.e. and e.g. in the above paragraph... I had to look up the usage to make sure I got it right! Some of you may be lucky enough to work on a clearly defined site with easy to understand boundaries. I have yet to be so lucky. Even the single buildings I'm working on seem to always be in a campus or master planned setting. As a result, there is no clear boundary and LEED allows you to determine a 'reasonable' one. More on that later... This is probably the most important item to define early on, as it will affect SSc2 (development density), SSc5.1 (protect habitat), SSc5.2 (open space), SSc6.1 and 6.2 (stormwater quantity and quality), SSc7.1 (heat island, non-roof), SSc8 (light pollution), and WEc1.1 and 1.2 (water efficient landscaping) calculations. Once the building is sited, it quickly becomes difficult to make changes. What makes it even more critical to determine is the fact that typically these credits are typically divided among four design team members: the architect, civil engineer, electrical engineer, and landscape architect. Even in the ideal world of total integrated design, at some point these folks are each going to be putting the finishing touches on the LEED documentation at their desk all alone. It's critical that if one party makes changes that the others are made aware and can adjust accordingly! When Do I Need a Reasonable Project Boundary? Again, if you have a single building on a "normal" site none of the following should apply to you. When the calculations call for volume and rate of stormwater leaving the site or allowable footcandles a 15 feet from the site boundary you're stuck with what you have. When your building is in the middle of a master planned development where your 'site' drains to retention facilities a block or two over and you're stuck with site lighting standards that run along the edge of your 'property' things get much more complex. Even though the stormwater is leaving the area around my building, it's not a drain (HA!) on the local infrastructure, and that lighting doesn't trespass on anyone, it's just to light a sidewalk that connects my building to one next door... Why should my project's rating be punished for good design that just happens to span large distances? How Do I Determine a Reasonable Project Boundary? Given that there are several buildings within one development you may choose to take the multi-building/campus approach when applying for particular credits, especially related to site issues. In that case you would have a larger campus/development site boundary and then separate buildings within that boundary. By following the AGMBC, it allows for these different boundaries (campus boundary vs. project boundary within campus) that may apply for different credits. The campus boundary must be consistent for all credits for which the campus boundary applies and project boundary must be consistent for all credits for which that boundary applies. It is up to the project team how to determine these boundaries for your particular projects whether by drainage plain, or some other means. However things such as open space and walkways may not be counted for more than one LEED building unless taking an aggregate approach. As you can see, what we're really talking about here is TWO boundaries... one for the campus and one for the project. Before I tell you what we're doing in this regard, it's very important that I tell you that they have not yet been approved as correct by the USGBC review team at this point. I will be sure to update this post when that happens. This picture is meaningless, but it looks like an upside-down man and I figured... What the hell? There's too much text in this post anyway. We decided that instead of using the entire development as our campus boundary, the area that feeds into a set of retention ponds would mark our campus, as that completely contains the all of the buildings that are seeking certification. As such, the stormwater documentation for all buildings will be identical. On one edge we extended the boundary to include some of the lighting we are installing along road that our buildings front. If we used the stormwater boundary one or two lights (out of many) would 'trespass' onto the adjacent site, but since it's still all internal to the larger development I don't feel guilty. On the whole, it's still a responsible development. The only reason we didn't set the whole development as the campus boundary is because it would be difficult to pull complete stormwater data for everything. Our engineers were doing calculations on the area we've included already. 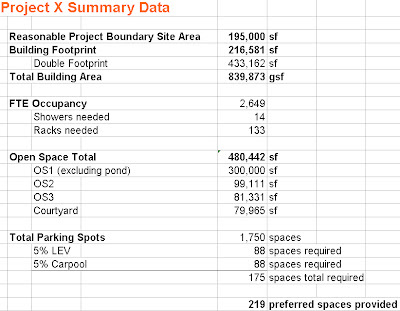 Our project boundaries were determined by the amount of open space needed to satisfy requirements for each building. I can hear many of you thinking about what a sham this is... that we're just setting boundaries in a point-mongering mentality. Though in a literal sense you're technically correct, it's important to note that the vast majority of the area surrounding our buildings is vegetated open space, a feat that was accomplished through the use of multi-story structured parking (at great expense to the owner) in an area that is generally characterized by large swaths of surface parking. Again, we have met the intent of the credit, and I feel that on the whole we're well within our rights to claim the space. To get to this point took a lot of back and forth between civil engineers, electrical engineers, and the project architect. We had to set a boundary, examine it from all sides, and reset the rest to that which is the best fit. Where on a 'normal' project I would suggest that materials selection and procurement is going to be your most frustrating task, on multiple buildings projects it's clearly these site issues that get to be a hassle. We've known all along that we're doing the right thing, it's just a matter of putting it in an acceptable framework to meet the credit requirements. Working on other projects has made me realize that how you determine these boundaries will be driven by different factors for different situations. PLEASE share your experiences with the world by leaving a comment! No comments yet? Can't believe that! I noticed you do not include your water area in the open space calculation. It might be fluffing your number, but wouldn't the surface of the water be considered open. Just a thought. And yes I have had some of the same issues with EB, between the owner, an engineer and the landscaper there are different numbers depending on the day. Wow, that's amazing you got feedback from someone at USGBC that you can have one site boundary for some credits (eg the campus boundary) and then a different project boundary for other credits…I am sure you read the disclaimer at the bottom of their email regarding staff opinions:) I agree the site boundary "definition" especially for phased development or multi building projects seeking their own certifications makes things interesting. Not only for the site credit issues you bring up, but also materials & waste tracking. For instance, we have a project where 8 buildings will ultimately share a master planned site (which is the project boundary for each individual building), but 3 have been built now (and successfully achieved Silver ratings!) and 5 will be built later – all share the same site though and the site work is all done up front, not in phases like the buildings. Thankfully all 8 buildings are pursuing LEED certification so we did not have to deal with what applies to the LEED vs. non-LEED buildings. We were able to maintain a consistent site boundary across all credits by defining the property boundary as the master plan site (which makes sense for things like stormwater & irrigation, though yes, there are off site basin areas). What we found somewhat challenging was apportioning the site to each individual project within the shared project boundary for other credits (like bike racks & preferred parking spaces for SSc4, open space area for SSc5, site materials value for MRc4 & 5 and site waste tonnage for MRc2). Anyway, some other fun issues that we ran into related to the site project boundary with this phased development project: allotting your designated parking spaces so that each building has properly apportioned preferred parking upon complete project build out as well as in the interim...for stormwater & landscape irrigation credits we have submitted two documentation scenarios to show compliance 1) at project completion and then 2) upon complete project build out. USGBC didn’t question the boundary definition but noted in the review comments that the project followed the site definition allowed under AGMBC and that the site boundary was consistent across all credits. For open space, the designated area was sized and allocated to each project by multiplying its apportioned SF % by the total development site. Site materials value for MRc4 & 5 and site waste tonnage for MRc2 were also apportioned based on the individual projects SF %. Anyway, as you say, defining a project site boundary that makes sense can be a challenge, and there isn’t a whole lot of guidance. Thanks for the great site & knowledge sharing! Thank you thank you thank you! Because I happened to be reading your blog (which I mistakenly considered to be procrastination from getting my LEED work done) I now have some clues to solving one of our biggest nightmares - defining a site boundary for a project on a small campus. Not to mention, it is because of YOU that I am actually going to be able to take my AP test on 2.2. (Just made the deadline!) I'll be back. I'm trying to figure out another way to get past the AGMBC documentation process. Here is our situation. We have one building on a shared site with another building on the same property. Both buildings will be submitting for LEED certification. The only credits that we want to overlap with the other building on is the SS 6.1 Stormwater Design Quantity Control and SS 6.2 Stormwater Design Quality Control. Can we submit our project boundary encorporating an on-site detention pond and then can the other building also include the detention pond into their site to obtain both credits without submitting for the AGMBC submittal? Any advice? I think you may help me with a question on a "LEED Project Boundary" problem. I work on a previously developed site in which there will be a development of 3 different buildings in three different phases. The owner wants to pursue LEED Certification only for the first one. According to you, how can I determine the LEED Project Boundary? Moreover there is a unique underground parking for all these three buildings...how can I define the number of the parking spaces dedicated for each building??? Thanks for the information. I know this was posted awhile ago, but was the option of using two boundaries ever confirmed by the USGBC? If you have 133 bicycle racks, don't you need 17 showers (133/8)?